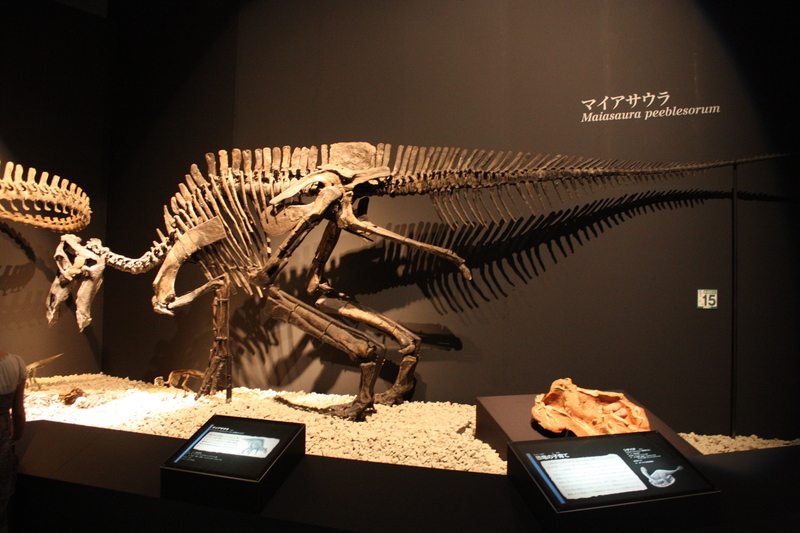 Yes I *still* have more photos to come from the Tokyo Dino Expo 2011, and it’s nice to get back to the sauropods. 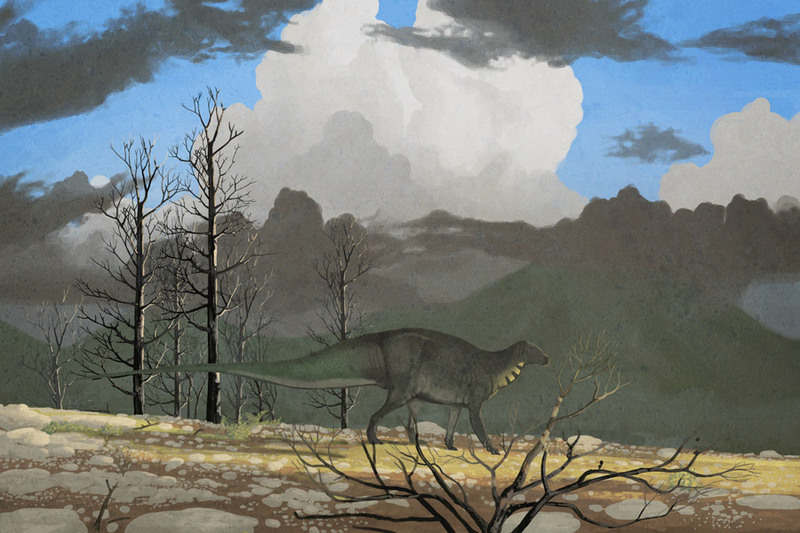 More specifically this sauropod, the rarely seen Nigersaurus. One of the rare and unusual rebbachisaurs the characteristic lawn-mower type skull s really rather obvious here, and the neck is pretty short and reminiscent of the dicraeosaurs. For me this was really nice to see as I’d yet to encounter any material or a mount of any member of this group, so even just a general feel for the proportions and to see a few details was nice. 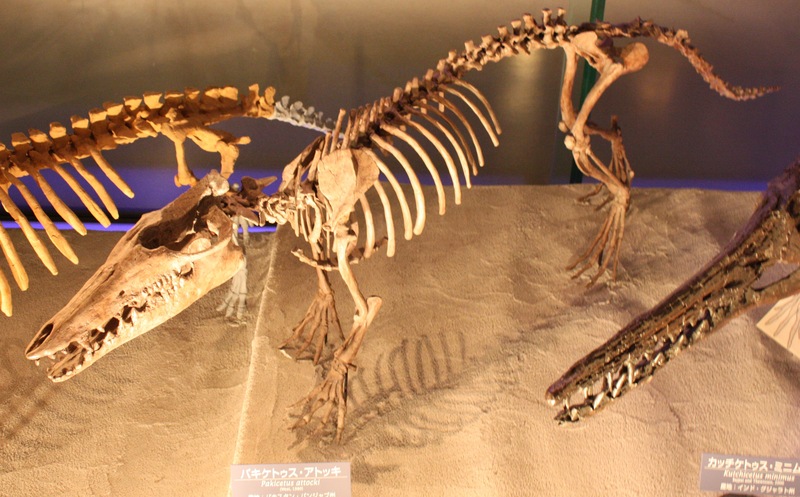 What is the proper common plural of ‘Maiasaura‘ anyway? Maiasauras, Maiasaurases, Maiasaurs? Anyway, doesn’t really matter, here are some of them, once more delving into my collection from the recent exhibition in Tokyo. 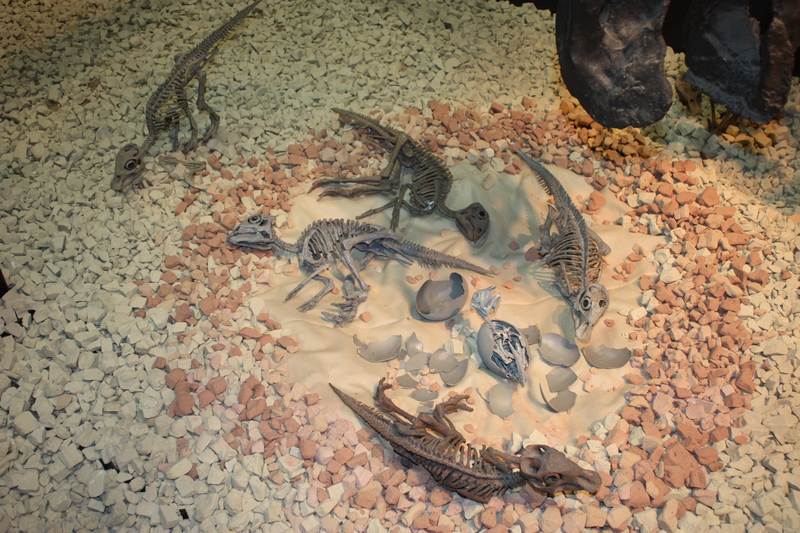 Above is a partial skeleton augmented by casts, and below a number of sculpted babies in a nest. 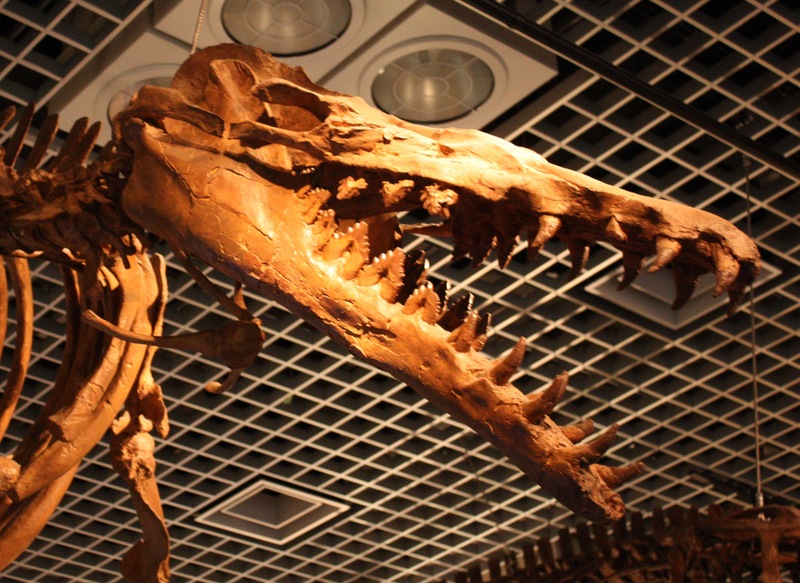 This ‘exploded’ cranium is a Tyrannosaurus on display in Toyko. It’s a really nice idea as I suspect quite a few people (understandably) tend to think of the head as just a couple of bones – the skull and jaw, when of course there are a great many components, and often of course these are rather more complicated than they appear from the outside with all the grooves and interlinking parts that fit them together. So this provides a nice exposition of that issue with the parts laid out in a such a way that it’s quite clearly a rex (and there is a mounted one just a few feet away) there’s obviously rather more complexity to it. Incidentally the odd angle of this photo is because this is lain out on the floor with a clear walkway over it, so you can actually walk over it as it were (which kids seem to love), but scratches on this make a ‘straight down’ photo impossible. 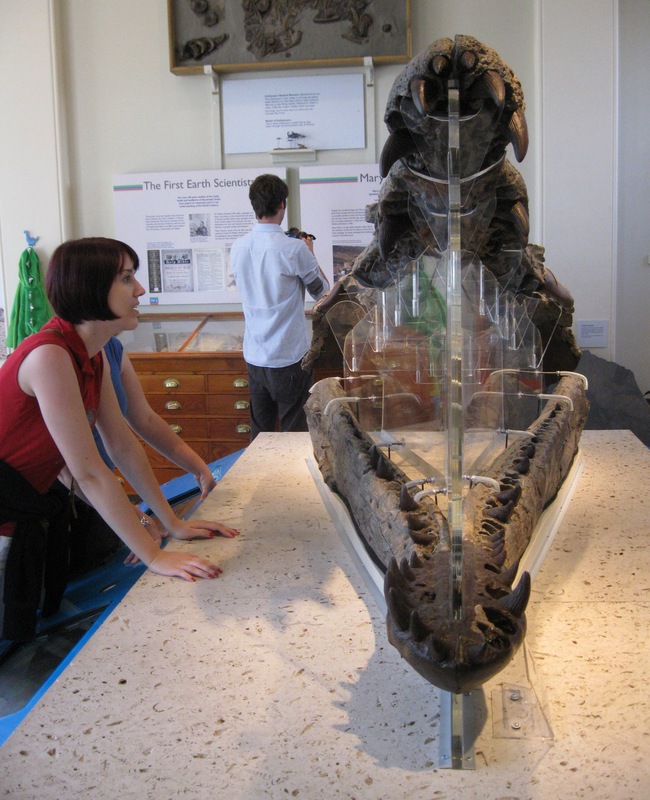 One novelty for this year’s SVPCA was a trip to the Dorset museum in Dorchester. OK, so a trip to a museum may not sound like a great departure for a conference, but the whole meeting basically upped sticks for an afternoon and moved over wholesale with a session of talks taking place in the museum before an evening public lecture. This was appropriately one of the marine reptile sessions given the presence of this massive pliosaur skull that sits in their collection. Also on display were a pair of Dimorphodon models. While their anatomical accuracy left something to be desired, I actually really liked them. There’s something very nice about the details present and the wings which so often give people real trouble were nicely made. 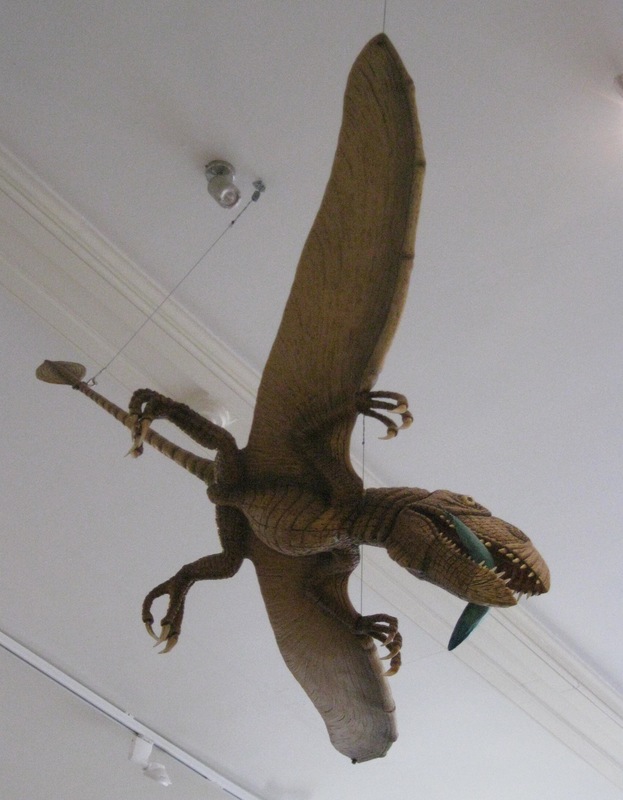 Food for thought if I ever get the opportunity to build my own pterosaur for a museum. Yes it’s time for some more “stinkin’ mammals”, though in my defence I generally keep the place pretty synapsid-free. 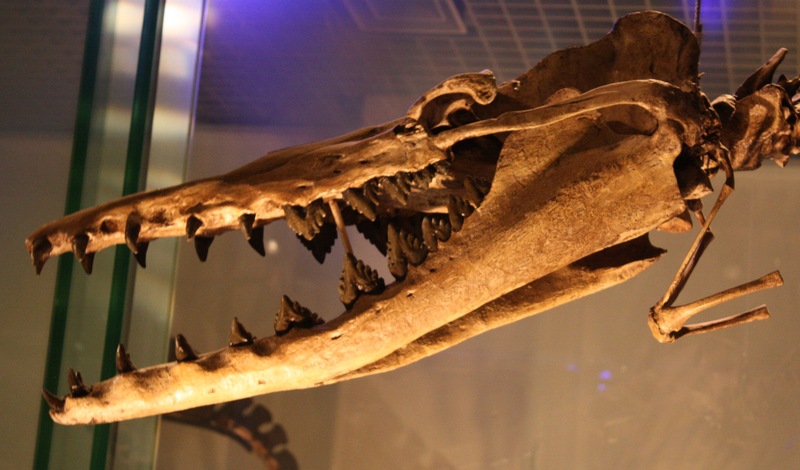 Anyway, one of the truly great transitional series in palaeontology is the origin of whales. 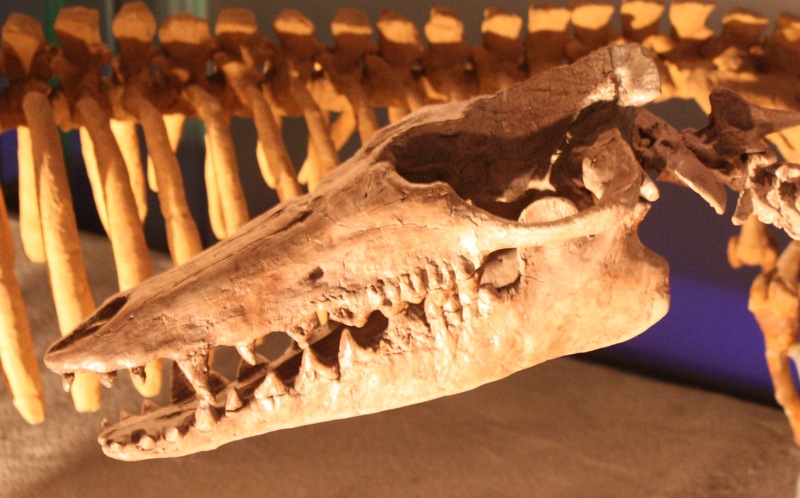 It’s not a surprise really, they are relatively big and recent animals that hung around in water, all things that help fossilisation. Combined with their nicely diagnostic anatomy and the public’s general affection for cetaceans, this makes them a superb example of a major transition (here from land to water, obviously) as well as making the origin and radiation of an important clade. I’ve used it in my lectures and it seems to be a particularly popular subject with the students. 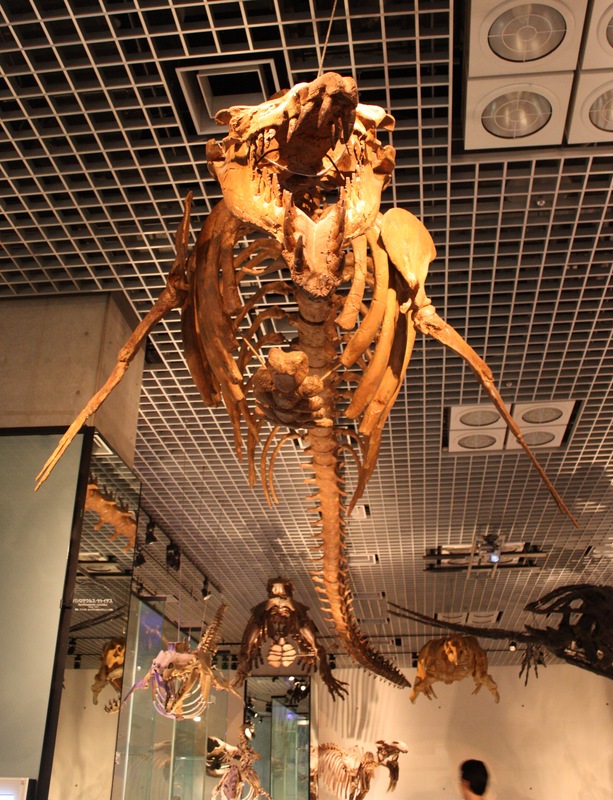 Among other things, the aquatic section of the ‘history of life’ room in Toyko houses a magnificent collection of casts of various stem whales. 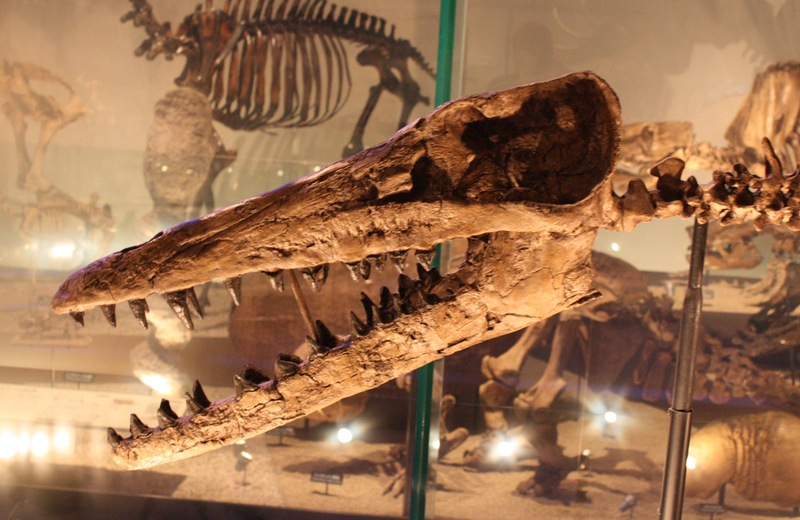 From Ambulocetus, Pakicetus and Basilosaurus (and indeed others) there is a lovely and clear pattern of the shape of the skull and teeth changing and the back elongates, and the hindlimbs atrophy. Put together, it’s a great series and I spent some time photographing as much of it as possible for my lecture notes. I’ll be able to make better use of this in the future thanks to such a great set-up. Another quick but important post. One of the best talks at SVPCA for me was that by Richard Edmonds on the fossil collecting code that has been developed for the Jurassic coast (abstract here). In short a plan has been developed, implemented, and is working with local professional collectors, the councils and academics working together so that the public can collect and explore the cliffs without damage to this, the professional collectors can stay in business, but important specimens are being donated or at least sold to museums so that science is benefiting as well. This lies rather in contrast to this. Yes, that’s a lovely Nyctosaurus being sold on e-bay and not the first one either. What’s more frustrating is that this specimen has been mentioned and illustrated in the literature. Yes, under rather odd circumstances I know but still, this is a real shame. And it’s far from the only dodgy thing floating around online, I’ve already seen what look like genuine specimens of Darwinopterus for sale, not to mention the usual round of Brazilian stuff. It’s hard to take really. I know there’s lots of things that should not be sold that are being, but pterosaurs, especially good ones, are really rare in the way that a lot of say dinosaurs and birds aren’t (even though obviously all specimens have value) so it is especially bad I feel. Ah well, if you have a few tens of thousands you’re not that attached to, pick this up and bung it in my direction please. The third and final show of Wednesday’s hat-trick of dinosaur shows was an odd Horizon special. For those who don’t know, Horizon, is, (or sadly, rather was) the UK’s flagship science show on the BBC, with really detailed explanations of properly cutting edge science. It has rather fallen away in the last 10 years or so and become a bit more about flashy graphics and controversy though it’s still important. (Oddly enough I managed to chat with a former producer of the show a couple of years back and he lamented how far he felt it had fallen, so this is not me just whinging). This show was an odd conglomeration of various Horizon shows over the last 30 some years to show how our impression and understanding of dinosaurs has changed. As a result this was for me almost the opposite arc of ‘How to build a dinosaur’ in that it would have probably been more interest to an expert than perhaps the general public. The clips themselves were fascinating and it was genuinely great to hear from people like John Ostrom and Luis Alvarez talking about their then brand new discoveries and see the reaction this brought from their contemporaries as well as looking at how this was presented to the public and the style in which this was brought forward and explained. However, in order to cram in a fair bit of this kind of stuff there was a noticeable lack of real background to each clip and the whole thing was a bit disjointed. That’s no surprise really, Horizon generally does a great job of building the story and giving the audience the background and showing why the experts are at the heart of things and how they go there. Shorn of that then you’re left with little more than a series of talking heads and quick exposition on a long and complex subject and of course one that was novel perhaps decades ago. As such I found it fascinating as I knew the history and the science and the people involved so it all fitted together fine for me. However, I do wonder if the casual viewer was not a bit lost being somewhat bombarded with three decades of developments in dinosaur science and dotting around through bird origins, the KT extinction, homeothermy and others all in an hour. Still, it was great from a scientific and historical perspective and i at least enjoyed it thoroughly. As I noted yesterday, the latest Planet Dinosaur was just one of a whole suite of shows on the BBC that ran on Wednesday. 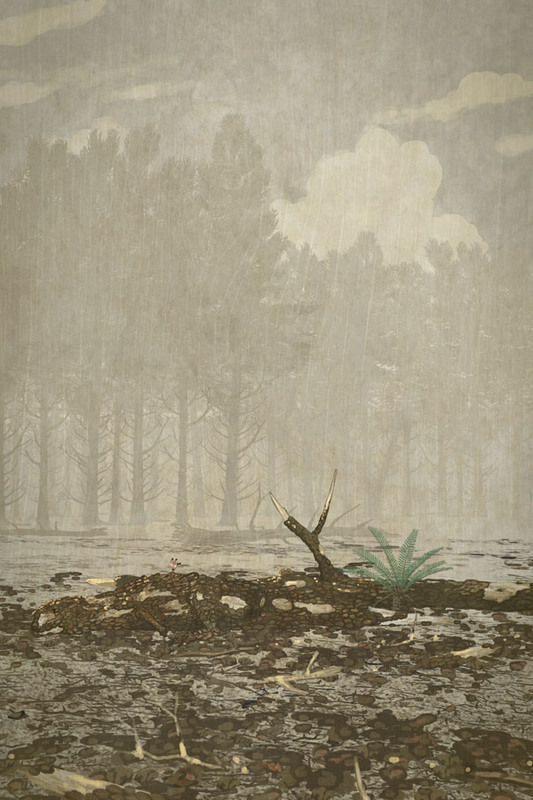 The second was a one-shot on BBC 4 with the above title and it was basically a behind-the-scenes of putting together an exhibition (the new one at the LA County Museum) backed by various little side routes about the issues of reconstructing dinosaurs based on incomplete remains from the ground to the museum hall. Now I must confess I have a big bias towards this show as it was hosted by a friend of mine and featured a number of friends and colleagues including Darren Naish and John Hutchinson. Still, trying to be impartial, I did like it and I think it brought forward a number of things that I’ve never really seen before on a dinosaur show – the decisions that go into posting mounts, reconstructing missing bones, and so on.It was a bit simple in places, but that’s really to be expected for something aimed at a very general audience. Certainly I suspect it made people think about issues they had probably never really considered before. My one real criticism would be that it was a bit disjointed. Everything covered was relevant, but there was no really clear thrust of how it all fitted together. A minute at the beginning and end laying out what we were about to see and how it fitted into the big picture. While obviously not his fault, Darren’s piece about Xenoposeidon was rather odd, and makes this point. Certainly it’s nice to show how things can be rediscovered in basements and newly recognised in the light of new research and people seeing things with fresh eyes. it makes the point about keeping collections and documenting them properly, the difficulties of taxonomy and working from incomplete material. But it doesn’t really tell you anything about building a dinosaur and so doesn’t really fit the rest of the show, regardless of how good it was. In short though it was a good quick round of various aspects of the public face of palaeontology and how researchers get there. A little light perhaps, but well rounded and certainly containing some nice, rarely seen aspects that would certainly inform many a casual viewer. 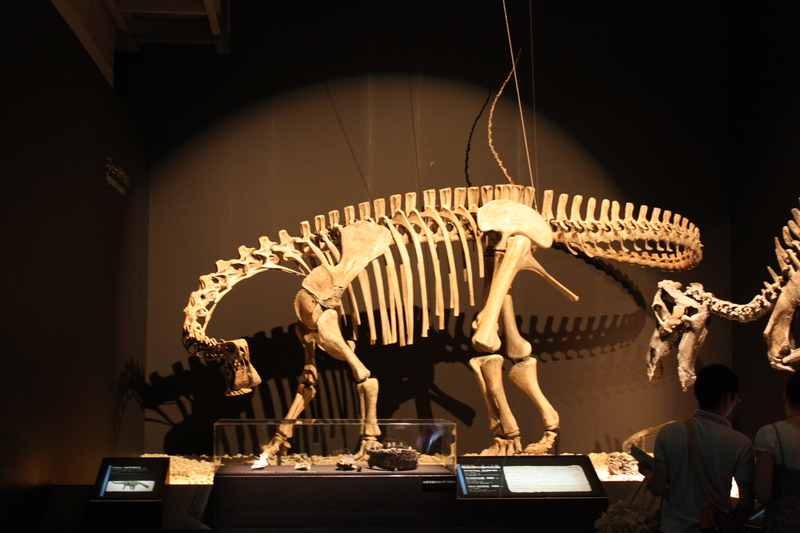 Sadly I was unable to make the International Hadrosaur Symposium that’s going on right now at the Royal Tyrrell museum. I had hoped to go and present some work on the Shantungosaurus quarries in Zhucheng but it was not to be. However, neither I nor you need miss out entirely as some of the lectures are going up on YouTube starting with an introduction by David Weishampel. Enjoy! h/t Tom Holtz for the heads up. Personally I blame the supervisors for this degenerate and possibly copyright breaking actions. Legal threats to be addressed to: SVPCA, the Pilot Boat pub, Lyme Regis. Last night in the UK saw three, yes three, dinosaur shows running consecutively on the BBC, starting with the second episode of the new Walking With Dinosaurs ‘update’: Planet Dinosaur. Readers of Tet Zoo will already have an idea of how I feel about it, but a few words of my own might be more revealing. First off, let me step away from my normal caricature and say that, on average, I liked the first episode. The animation was OK, if not great, certainly better than many I’ve seen of late, and the overall design and colour etc. was well done. It looked reasonable and thought through and while there’s always nits to pick, it was basically ‘good’. 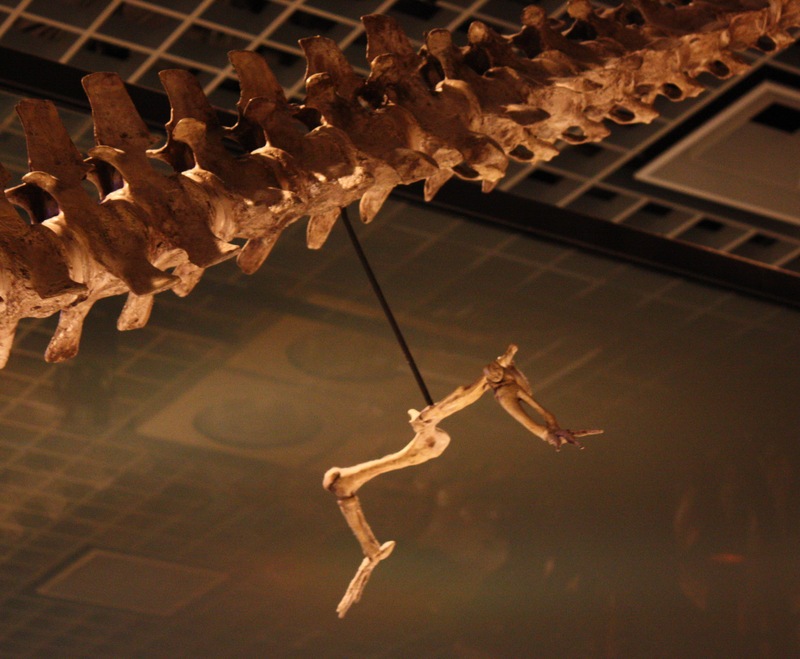 It was certainly a near revelation to see the actual science and fossils shown behind these things. It’s one thing to have a talking head but another to actually show chunks of jaw and slabs of specimens to demonstrate just how how much material there was and how it looks and what we are basing the science on. That was a major improvement and great to see. Also good was the judicious use of caveats to reveal bits of uncertainly like “X is thought to do Y” and “A may have acted like B”. Much more of this in the future please. So the bad? Well, as ever there was some injudicious hyperbole, exaggeration and downright unsupported speculation on screen. As noted on TZ, I can buy Spinosaurus as being 17 m long, and yes, that was said once in the literature. But there’s good reason to think that this is not only an upper estimate, but a very high one, so why is this not the subject of a bit more “may have been / could have been / the biggest of which might have got to”? The mix was frustrating and pointless when they have done so much good work to show the fossils and explain the data, why then just throw in the Rugops was a dedicated scavenger based on errr, ummm. What compounds this is they can’t complain about bad advice or declare incompetence. They had a good list of advisors and got lots very right, so why the need for the mad speculation or suddenly drop a lot of caveats. I also suspect it’ll give a very false level of confidence in the data since the casual viewer would, I suspect, even hope, be impressed by the level of data given for various ideas but then might not notice the glossing over of some of these other points and simply assume they’re as well documented when they are not. Moving on to the second episode, I was rather less impressed sadly. If nothing else there was simply some bad writing – in near consecutive sentences were were told “it’s impossible to be certain that Gigantoraptor had feathers” and “it seems almost certain that they had feathers”. Errr, yeah, not quite opposites, but surely better could have been done with the text. 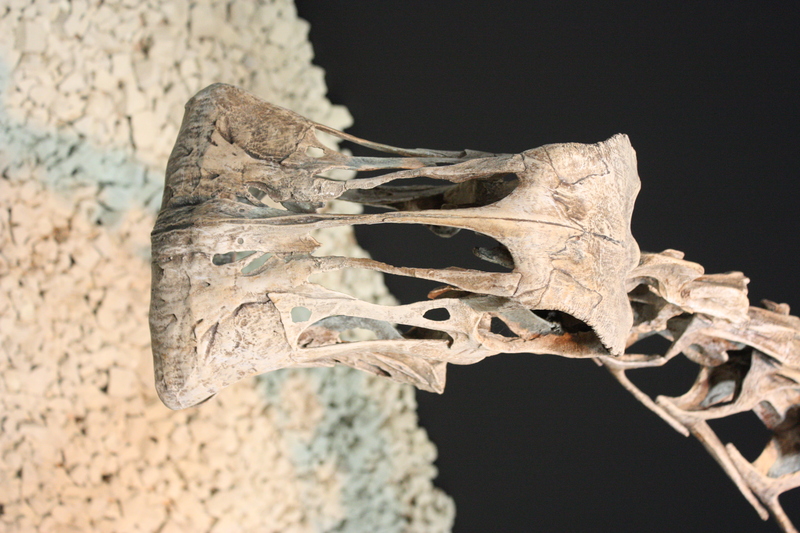 We were also told that oviraptorids [sic] had no teeth, but the example they gave was Caudipteryx – one of the few toothed species. 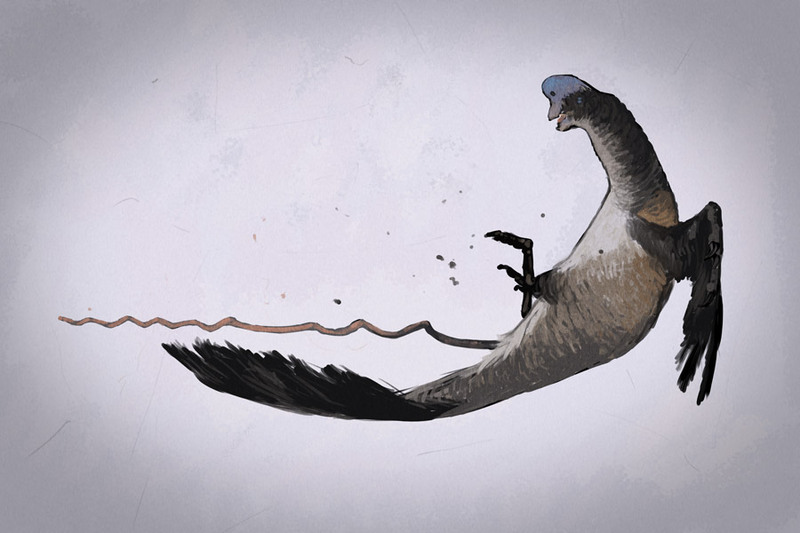 And then yes, they went there and had Sinornithosaurs not only gliding around but being venomous. Ah yes, you see what documentary makers still have yet to learn it seems is that just because something has been said, doesn’t make it right. Please don’t use things this speculative, unsupported and unpopular, it’s not helping communicate or entertain which I rather assumed was the point of this. So on balance I was really pretty impressed with the first episode and rather less with the second. I guess we’ll see how the series pans out over the coming weeks. For all my whinging, it’s already better than many I have seen, though it would have been nice if the second episode improved on the first rather than fell away. Late little edit: I forgot to mention there are some odd little inconsistencies in there too which I assume are the result of different teams doing different things. Sharp eyed people might have noticed the pterosaurs with ankle attached wings (yay) but their little black and white skeletal outline during the flash-up science section showed the wings attaching to the end of the tail with the legs completely free. Eeek twice. Not only is that horribly wrong, but isn’t what they’d even illustrated seconds before. In addition to the official talks and posters at SVPCA there’s always various discussions and meet-ups to get people talking and the science discussed. This year however there was a bonus presentation by John Conway on ideas that might just be possible (if incredibly unlikely) for dinosaurs that we can’t disprove becuase we have only bones and tracks. In short, John was deliberately pushing into the territory of the deeply implausible and reasonably unreasonable reconstructions to give us a good laugh, but also make us think. This was described by Mike Taylor as “Brilliant but retarded” and it was an apt description. The images were, as ever fro John, beautiful and evocative, but the ideas mental and would be ludicrous were it not for the fact that they are just sort of remotely possible and he knew full well what he was doing. Anyway here are a few of them. My thank to John for letting me use them and a reminder that these come courtesy of John’s Ontograph Studios. 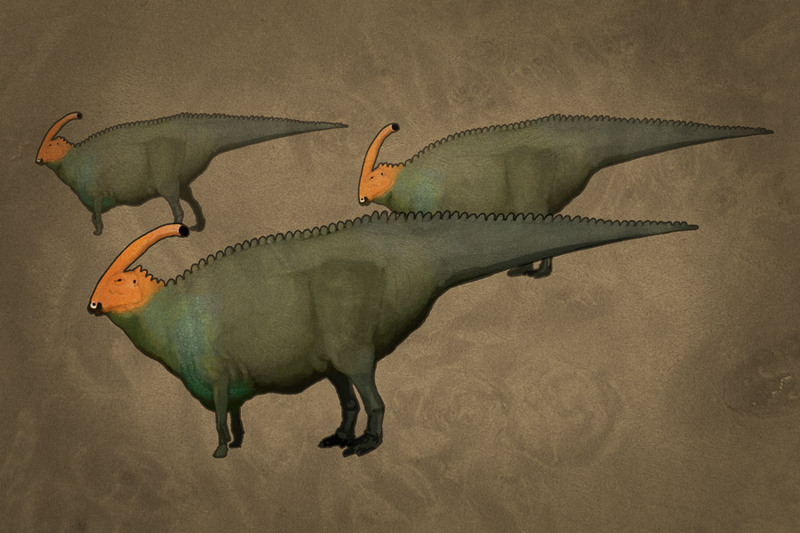 Second here’s some monstrously fat Parasaurolophus. They rather remind me of sheep in their shape, though of course without the wool. Moving towards sauropods, here’s a Camarasaurus (well, a young one) rolling in mud as a sunblock and general skin treatment plan. 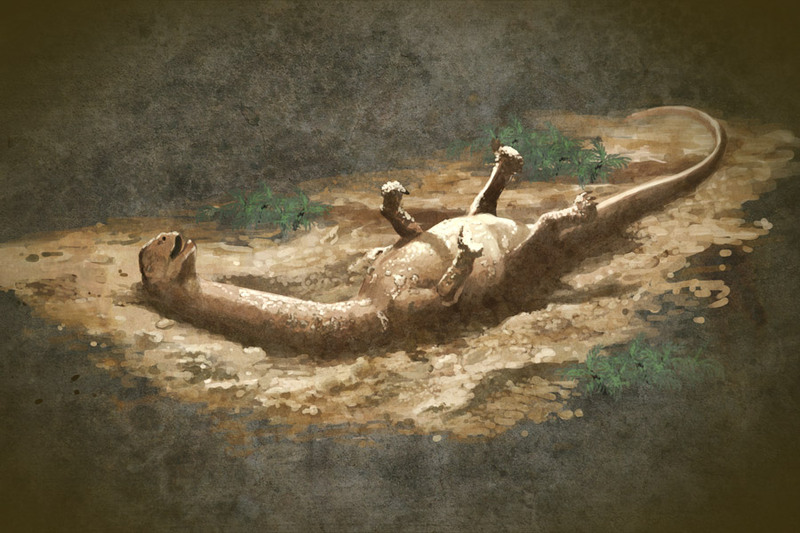 The point here is not so much the mud rolling, which seems pretty likely to me, but really could a sauropod get down and really roll around like that? 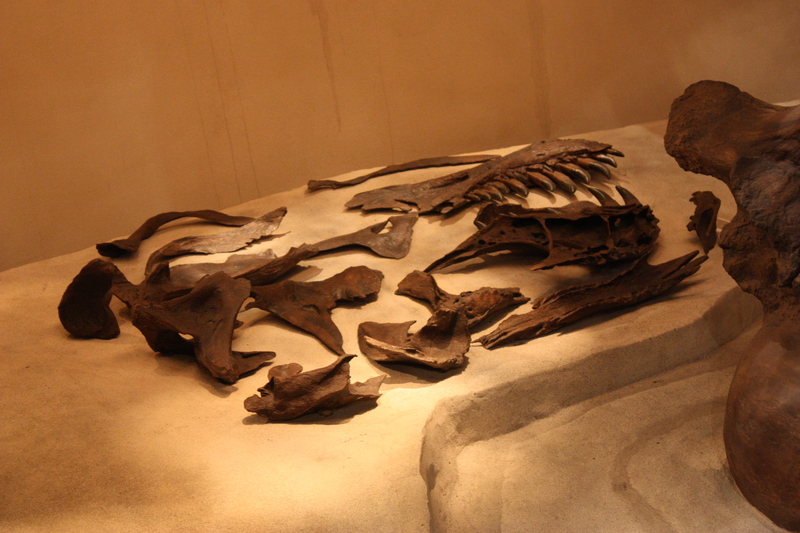 And finally this picture of Tenontosaurus. As John notes, contrary to every other piece of palaeoart of this animal ever, at least some individuals probably spent some of their time not being torn aprat by a pack of Deinonychus.